Set a credit limit for the line of credit, the amount not to exceed when disbursing funds to the borrower. Set an interest rate on the loan. The rate is an annual rate (sometimes called an APR). 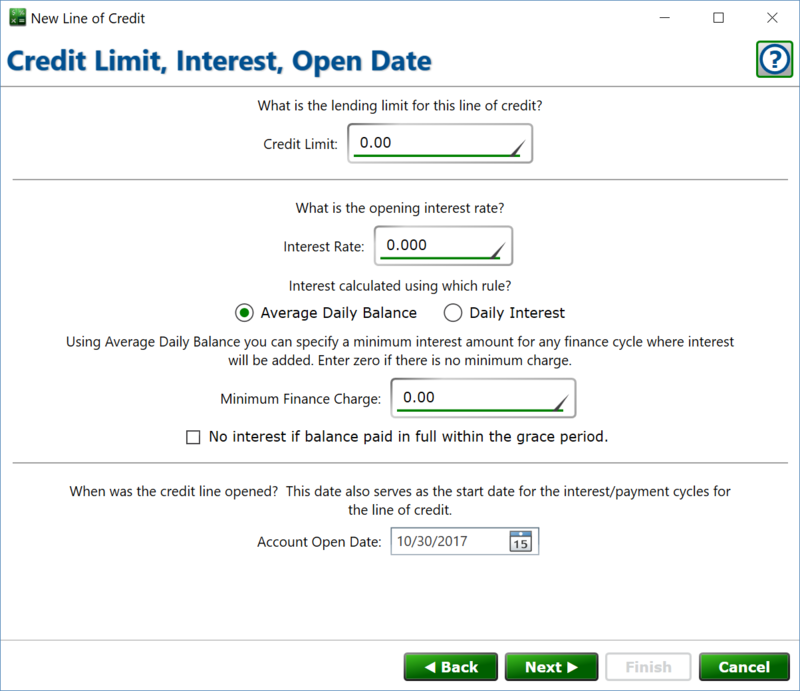 Moneylender 3 has two mechanisms for computing interest on credit lines - an Average Daily Balance method and a Daily Interest method. Average Daily Balance will compute the average balance for each cycle and adds interest only once per cycle. Daily Interest will add the daily accrued interest when any transaction occurs that affects the interest bearing balance, as well as on the normally scheduled cycle dates. Because the Average Daily Balance method adds interest exactly once per cycle, it allows for some extended features. With Average Daily Balance selected, you can specify a minimum interest charge for any cycle that will have non-zero interest. This minimum is not charged if the "No interest if paid in full" option is selected and a period is paid in full within the grace period. Also available with the Average Daily Balance option, Moneylender can detect if the total balance on a loan drops to zero within the grace period of a cycle end date, and will skip the interest for that cycle. Check the box to enable this behavior. Specify the opening date on the line of credit. This date will be the start date for the credit line's cycles.